Our organization has earned immense status of repute in the manufacture, supply, trade and service of Solar Project Kits. This is manufactured at our state of the art facility using the high grade material and advanced technology. Our range is powered by excellent batteries having superb backup. 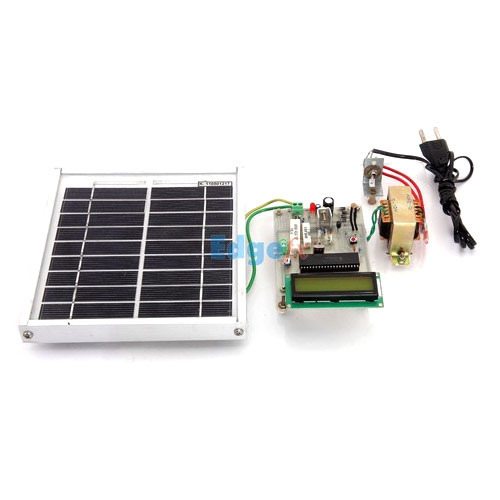 Solar Energy Measurement System: Solar photo-voltaic data such as voltage, current, temperature, light intensity for calculating solar insolation etc are monitored by a PIC micro-controller having built in multi channel ADC and displayed on a LCD screen. Power Saver for Industries & Commercial Establishments: The project is designed for lagging current compensation by engaging shunt capacitors automatically as per the requirement against the inductive loads largely used in industries. This saves lot of power and thus reduces electric bill in domestic and commercial establishments. Solar Powered Auto Irrigation System: The project uses a solar powered pump operated automatically for irrigation purpose,on sensing the soil condition.By using solar power system, dependence on erratic commercial power is not required. A microcontroller of 8051 family is used to control the whole system. A motor is provided as load for demonstration purpose. Solar Power Charge Controller: The solar energy is converted to electrical energy by photo-voltaic cells. This energy is stored in batteries during day time for utilizing the same during night time. This project deals with a controlled charging mechanism which over charge, deep discharge and under voltage of the battery. Distance Measurement By Ultrasonic Sensor: The project is designed to measure the distance of any object by using an ultrasonic transducer. The transmitted ultrasonic waves are reflected back from the object and received by the transducer again. The total time taken from sending the waves to receiving it is calculated by taking into consideration the velocity of sound by a program running on the microcontroller. The distance is then displayed on an LCD interfaced to the microcontroller of 8051 family. Auto Intensity Control Of Street Lights: White Light Emitting Diodes (LED) replaces HID lamps in street lighting system to include dimming feature. A microcontroller of 8051 family is used to control the intensity by developing pulse width modulated signals that drives a MOSFET to switch the LEDs according to achieve desired operation. Density Based Traffic Signal System: The project is designed to develop a density based dynamic traffic signal system. The signal timing changes automatically on sensing the traffic density at the junction. IR sensors are used to monitor the density of the vehicles at the junction. The signals from the IR receivers are fed to the microcontroller to follow different time for different level of traffic. Ultra Fast Acting Electronic Circuit Breaker: The project is to shut down the power supply when it is overloaded. Conventional circuit breaker like MCB based is on thermal bimetal lever trip mechanism. It is very slow and the trip time is dependent upon the percentage of overload. This project senses the current passing through a series element and the corresponding voltage drop is compared against the preset voltage proportional to the current by a level comparator to generate an output for the load to trip. Auto power supply control from 4 different sources: Solar, Mains, Generator & Inverter to ensure no break power: The main scope of the project is to consume the power from supply mains, generator, inverter and solar optimally by using appropriate program through microcontroller in most cost effective way. Sun Tracking Solar Panel: The project uses a solar panel coupled to a stepper motor to track the Sun so that maximum sun light is incident upon the panel at any given time of the day. The microcontroller used is programmed to rotate the stepper motor in regular time intervals so that it tracks the sun.This is better compared to light sensing method that may not be accurate always. The project uses a dummy solar panel for demonstration purpose.